Amy Thomson holds 2-month-old Isla in Seattle Children's Hospital in early 2014. 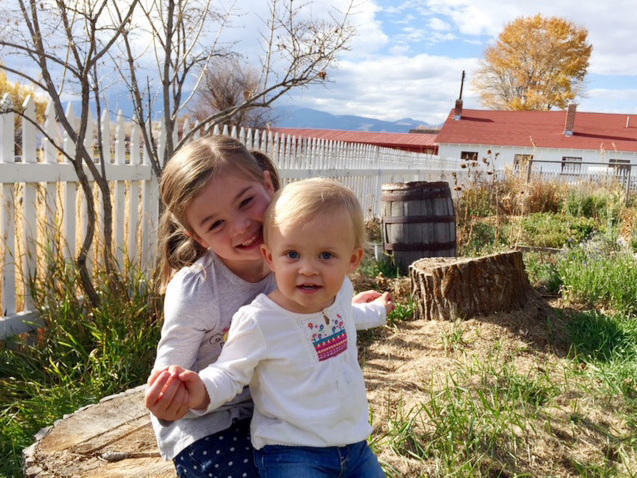 When the Thomson family learned Isla's heart was failing, they took an air ambulance from Butte, Mont., to Seattle to get medical care. Isla Thomson with her older sister. Isla turned 2 years old in November. There were close to 3,000 air ambulance flights in Montana in 2014, and Amy Thomson was on one of them, curled up among the medical bags in the back of the fixed-wing plane. Her 2-month-old daughter, Isla, had a failing heart, and the hospital that could help her was 600 miles away. "They did such wonderful care of her, and they tried to take great care of me, but in that moment I couldn't let go," Thomson says. "I was so afraid that if I closed my eyes that would be my last vision of her." Thomson watched as Isla was placed in a small box strapped to a gurney inside the air ambulance flown by Airlift Northwest. Seattle Children's Hospital saved Isla's life. Her family's health insurance took care of the costs beyond her deductible — except for that critical air ambulance ride to Seattle. The Thomsons read their insurance plan and interpreted it to mean that any emergency medical transportation was covered. But it turned out the air ambulance company was out of their network, and they got a bill for $56,000. Thomson remembers looking at the bill and thinking, " 'You've got to be kidding me!' Here is the flight that ultimately saved Isla's life by getting her to where she needs to be. And yet is going to put us potentially in financial ruin. Or at least kill our future dreams as a family." When a patient needs an air ambulance, the first priority is getting needed care as fast as possible. Patients don't always know who is going to pick them up or if the ambulance is an in-network provider. That can make a huge difference — and lead to huge bills. "Of all the complaints we have received in our office, not one person was uninsured," says Jesse Laslovich, legal counsel for Montana's insurance commissioner. "They're all insured. And they are frustrated as heck that they're still getting $50,000-balance bills." States can regulate some medical aspects of air ambulances, but federal laws prevent states from limiting aviation rates, routes and services. The cost of an air ambulance bill is split into two main parts, according to a study completed by the Montana Legislature. First, a liftoff fee, which ranges from $8,500 to $15,200 in Montana, plus a per-mile charge for the flight, which ranges from $26 to $133 a mile. Some air ambulance companies offer membership programs as protection from big bills. For an annual fee of about $60 to $100, patients who use that company's services face no cost beyond what their health insurance pays. But Laslovich says that doesn't always work, because patients can't always know who is coming to pick them up. "You want to know what my personal opinion is about what the problem is?" Laslovich asks. "It's money." There is a lack of understanding about the actual costs of running an air ambulance business, says Rick Sherlock, the president of the Association of Air Medical Services. The costs include specialized labor, training, equipment and fuel. "So those cost drivers are there, and [it's necessary] to maintain readiness to respond 24 hours a day, seven days a week, 365 days a year," Sherlock says. He says some air ambulance companies remain out of insurance networks because they can't always reach in-network deals that allow them to stay profitable. "I think what you also have to look at is that negotiations between [air ambulance] companies and insurance companies take place when there's good negotiations on both sides," Sherlock says. "In situations where there may be only one or two insurance options in an area, it's harder and harder to negotiate on a level playing field." For people who think they are protected from crippling health care bills because they have insurance, the cost of an ambulance ride can be a shock. A Montana interim legislative committee is now investigating the wide range of pricing by air ambulance companies within the state. The state of Maryland has taken on a similar investigation. In North Dakota an air ambulance company is suing the state for adding regulations on the industry. Thomson ended up not having to pay for her flight, but only after repeated appeals. According to Thomson, on the same day they were arranging a time to meet with a lawyer, she was notified by her insurance company that it would pay an additional amount of about $30,000, as well as the $13,000 out-of-network fee to the air ambulance company. The air ambulance firm waived the rest of its fee. Isla turned 2 in November. She's a healthy child with big blue eyes, but at times her mother still worries. "Nobody takes a life flight for a joy ride," she says. "You're not going on Kayak.com and booking a life flight." Thomson didn't think the flight should be free but says the huge bill felt wrong. "I ethically believe this is a part of health care," she says. "This is not some separate entity. There is something ethically wrong that these companies are profiteering off of people's worst moments in their lives." Copyright 2016 Montana Public Radio. To see more, visit Montana Public Radio. In rural areas, specialty medical care can take hours to reach by car, so people who need emergency care often rely on flights - air ambulances. Montana Public Radio's Corin Cates-Carney brings us this story on the cost of bridging the gap between rural America and advanced medical care. CORIN CATES-CARNEY, BYLINE: Butte, Mont., is an old mining town tucked away in the southwest corner of the state - population about 34,000. The remote mountains and wildlife make it a beautiful place for the locals to live, but like a lot of rural America, advanced medical care is far away. They were close to 3,000 air ambulance flights in Montana in 2014. That year, Butte resident Amy Thompson was on a flight with her 2-month-old daughter, Isla. AMY THOMPSON: I could still close my eyes and - sorry - they - you know, they did such wonderful care of her, and they tried to care for me. But in that moment, I was so afraid if I closed my eyes that that would be my last vision of her. CATES-CARNEY: Thompson curled up among the medical bags in the back of the fixed-wing plane. Isla had a failing heart. The closest hospital that could help her was 600 miles away. 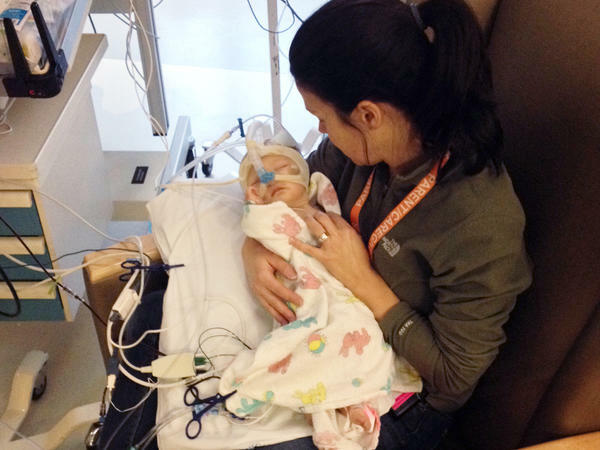 Seattle Children's Hospital saved Isla's life. Her family's health insurance took care of all the cost beyond her deductible except for that critical air ambulance ride to Seattle. The way the Thompsons read their insurance plan, they thought any emergency medical transportation was covered. But it turns out, the ambulance company was out of their network, and they got billed $56,000. THOMPSON: And here's the flight that ultimately saved Isla's life by getting her to where she needs to be, yet it's going to put us potentially in a financial ruin or at least kill our future dreams as a family. CATES-CARNEY: When a patient needs an air ambulance, the first priority is getting them the care they need as fast as possible, so patients don't always know who is going to pick them up or if the ambulance is an in-network provider. That can lead to huge bills. Jesse Laslovich is the legal counsel for Montana's insurance commissioner. JESSE LASLOVICH: Of all the complaints we've received, not one person was uninsured. And they're frustrated as heck that because they're insured, they're still getting $50,000-balance bills. CATES-CARNEY: States can regulate some medical aspects of their ambulances, but federal laws prevent states from limiting aviation rates, routes and services. Air ambulance companies are now offering membership programs as protection from big bills. For an annual fee of about 60 to $100, a patient faces no cost if they use that company's services. But Laslovich says that doesn't always work; a patient doesn't always know who's going to pick them up. He says patients are totally at the mercy of air ambulance companies. LASLOVICH: You want to know what my personal opinion is about what the problem is? It's money. CATES-CARNEY: But the president of the International Association of Air Medical Services, Rick Sherlock, says there's a lack of understanding about the actual costs of running an air ambulance business. RICK SHERLOCK: So those cost-drivers are there to maintain readiness, to respond 24 hours a day, seven days a week, 365 days of year. CATES-CARNEY: He says some air ambulance companies remain out of insurance networks because they can't always reach in-network deals with insurance companies that allow them to stay profitable. SHERLOCK: In situations where there may be only one or two insurance options in an area, it's harder and harder to negotiate on a level playing field. CATES-CARNEY: Amy Thompson ended up not having to pay but only after a lot of hassle. Once her family talked to a lawyer, the air ambulance company worked with her insurance company and waived the bill. Her daughter, Isla, turned 2 years old in November. She's a healthy, big, blue-eyed child now, but at times, her mom still worries. THOMPSON: Nobody takes a life flight for a joyride. And I guess for me, it's not that we didn't feel like some sense of responsibility for paying anything at all. It's just, there's something ethically wrong that these companies are profiteering, essentially, off of people's worst moments in their lives. CATES-CARNEY: A Montana interim legislative committee is currently investigating air ambulance companies' wide range of pricing within the state. Maryland is taking on a similar investigation. But in North Dakota, an air ambulance company is suing the state for adding regulations on the industry. For NPR News, I'm Corin Cates-Carney in Helena, Mont. SHAPIRO: This story is part of a reporting partnership of NPR, Montana Public Radio and Kaiser Health News. Transcript provided by NPR, Copyright NPR. Montana policymakers looking to protect consumers from giant bills for air ambulance service are taking a close look at North Dakota’s attempt. North Dakota’s law was struck down by a federal judge last month.